Spinnato, Kropatsch, Clinard, Schuelke and Associates. There were a lot of names on the door, and not a one was easy to pronounce or Google. 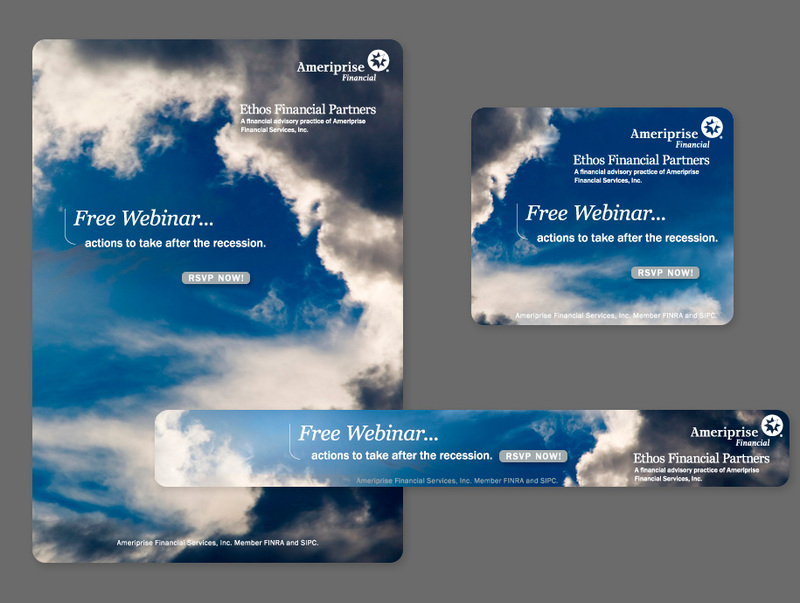 One of the top-ten in the nation, Allegory worked with this Ameriprise Financial advisory practice through the change of their name to Ethos Financial Partners. 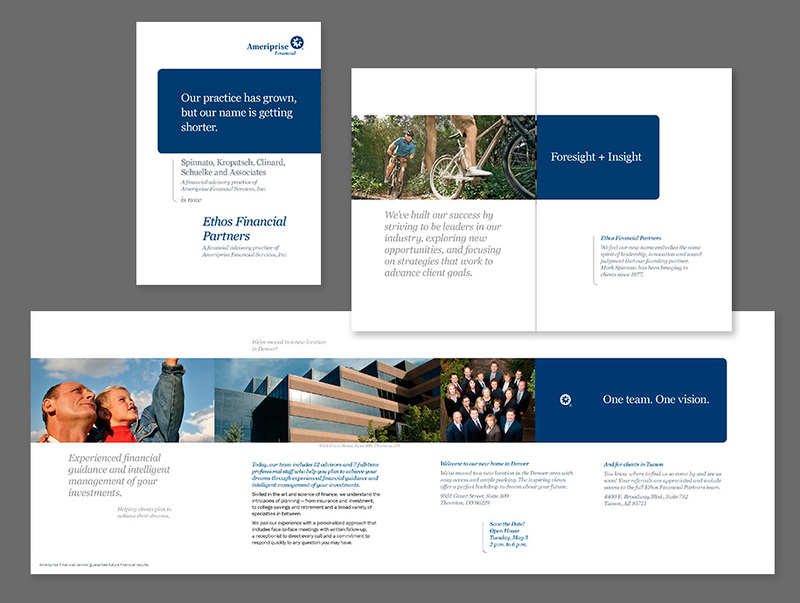 New brand language and designs worked solidly in conjunction with Ameriprise corporate brand guidelines while creating a unique presence for the Denver-based group. Allegory really spent time getting to know us. 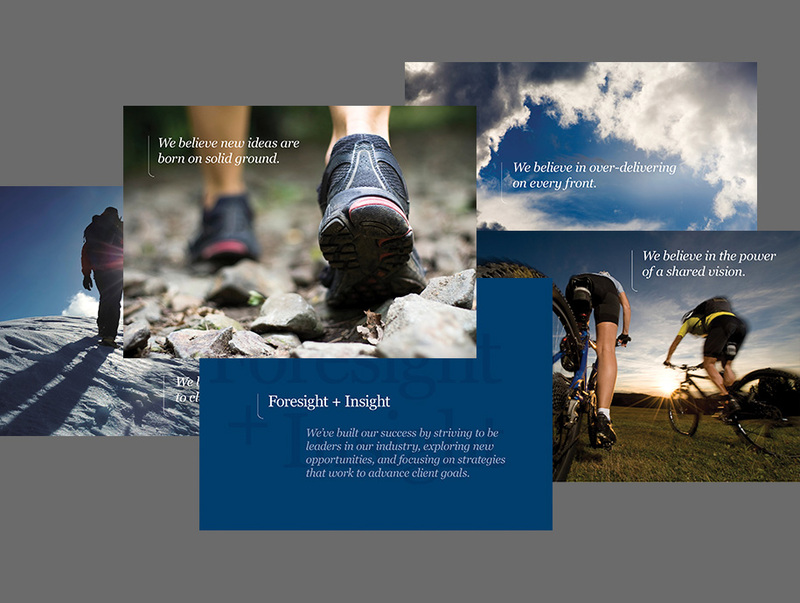 Our new brand reflects who we are within the larger Ameriprise organization. It inspires our team and will attract the right people and opportunities as we continue to grow. In the freedom to climb to new plateaus. We’ve got the gusto to explore what’s gray. Nobody wants to imitate average. The 800-pound gorilla is still hungry. In the power of a shared vision. In over delivering on every front. Strong systems support our individualized approach. Expert guidance is both wide and deep. Clients trust us to just take care of it. New ideas are born on solid ground. 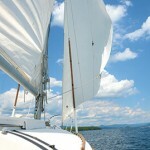 Affluence is built on a clear vision and a smart plan. In following rules while being anti-corporate, cool and autonomous. 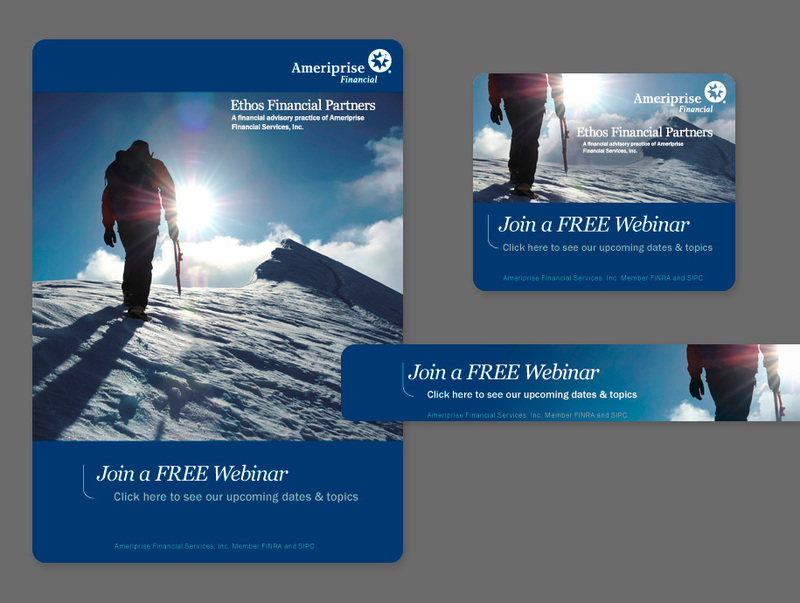 We are creating the future of Ameriprise. Mark Spinnato founded this firm as a single financial advisor in 1977. With the gusto to explore what’s gray, he carved a new path, establishing one of the first Ameriprise franchises to operate as a partnership. Today, our team includes 12 advisors and 7 full-time professional staff skilled in the art and science of finance. 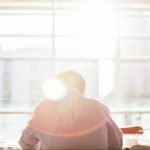 We pair our experience with a personalized approach that includes face-to-face meetings with written follow-up, a receptionist to direct every call and a commitment to respond quickly to client needs. Our client satisfaction says it all. 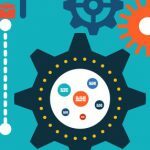 We over deliver on every front and understand that process support progress. 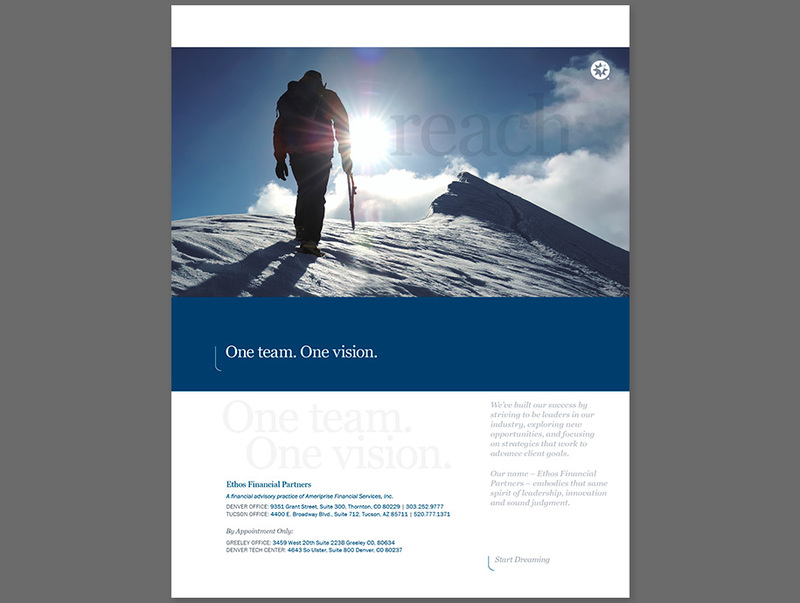 We’ve built our success by striving to be leaders in our industry, exploring new opportunities, and focusing on strategies that work to advance client goals. 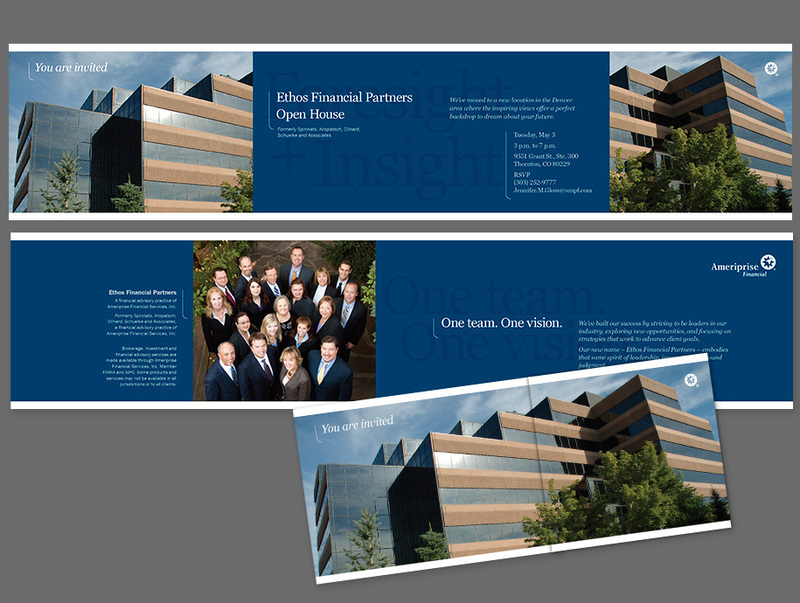 Our new name – Ethos Financial Partners – embodies that same spirit of leadership, innovation and sound judgment. It also allows us to grow in new directions. Continually driven, we believe we can follow the rules while being anti-corporate, cool and autonomous. That’s what gives us the freedom to climb to new heights. 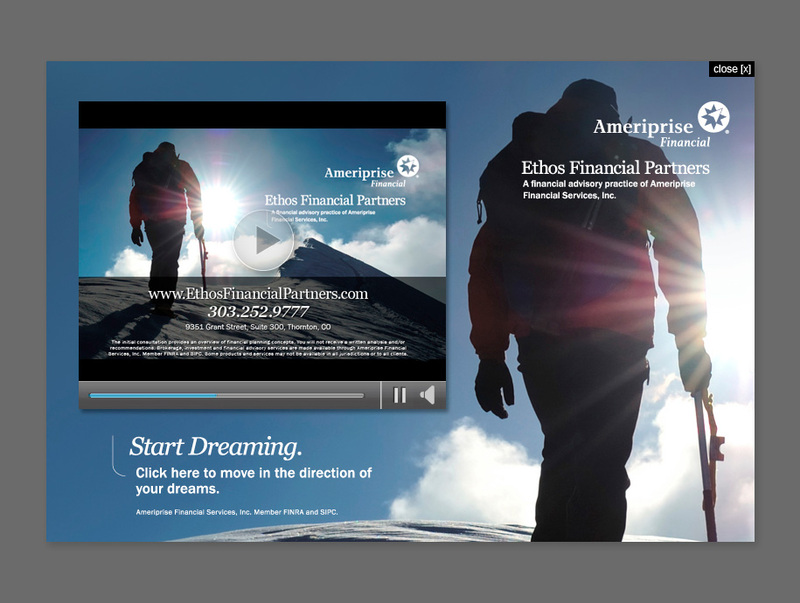 Because nobody wants to imitate average and we are creating the future of Ameriprise.